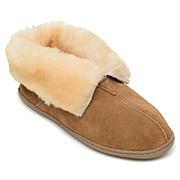 You're free to roam in the Cally, Minnetonka's cozy slipper. Crafted from supple suede with a plush pile lining, these durable house shoes feature creped-rubber soles for puttering around the house or patio and for quick dashes to the curb. Perfect for chilling at home or tackling a few projects in comfort. I absolutely love these shoes. I don't like wearing shoes in the house and I don't like going barefoot but these are perfect. They fit true to size, easy to slip on and off, the support is good. I was fearful the inside would be too hot for me but its not at all. I wear these inside and even when I go outside to get the mail, water the plants, etc. I just think they're perfect. Cute but sole is totally flat. I inserted a "Superfeet Green" insole since I have plantar fasciitis and heel spurs. Very comfy now. 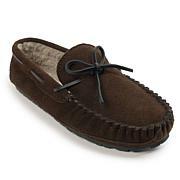 These suede slippers stretch in width as you wear them in. I have wide feet so that is fine by me. You can undo the bow and synch in the leather tie to tighten it. Quality is good. I wash these in cool water in Woolite ( no dryer) and they come out clean like new. Have worn these running errands and no one seems to realize they are slippers. No support at all . I like to return them but not return option too .Do not buy , Very poor quality .